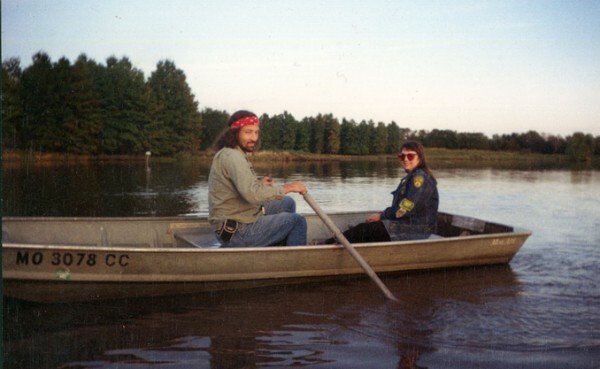 Obbie and RoZ take a little boat ride on a lake outside Kansas City, MO on October 1, 1993. While living in Philadelphia, I used some vacation time to visit some friends in Kansas City. I stayed with a couple who took me to an event the night before, which was where I met RoZ for the first time. On our first full day together, the four of us (five actually, as they had a toddler that came along) took a drive into the country, where we found a couple of boats available for paddling around. We’re still as happy as we were that day, even though we’ve never been in a rowboat since. This entry was posted in Cool stuff, Stories. Bookmark the permalink.